Mapping The Commodore 64 - RELOADED! 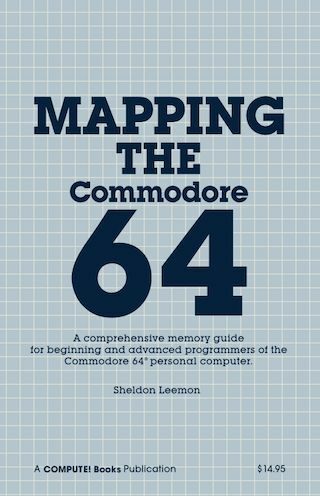 The best technical C64 book. And by a substantial margin too! This is THE best reference ever written for the Commodore 64. Not only it gives detailed description of practically every single functional memory location but also describes many programming techniques and gives examples. Descriptions elaborateness levels are spot-on what one could wish: very brief and high-level when there is not much to talk about like a range of addresses, which are free for arbitrary use, down to single bit being split into proverbial pieces and taken apart for perusal whenever the author feels it could help the programmer. A great help in achieving a desired result or understanding what's happening under the bonnet. If there was only one, single book to choose - I would say this is the one beyond any doubt. 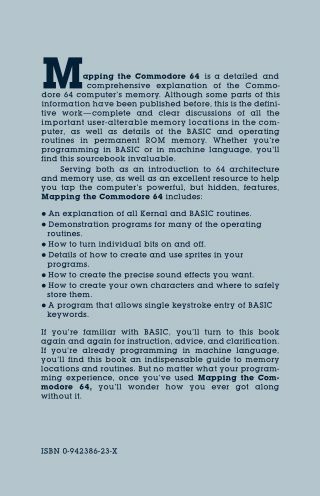 Unlike Commodore's own "Programmer's Reference Guide" It doesn't deal much with things, which are not specific for the Commodore machines or the 64 in particular, yet when it comes to Commodore's peculiarities it covers things thoroughly, helping a tremendous lot. Kudos! The best technical C64 book. And by a substantial margin too!